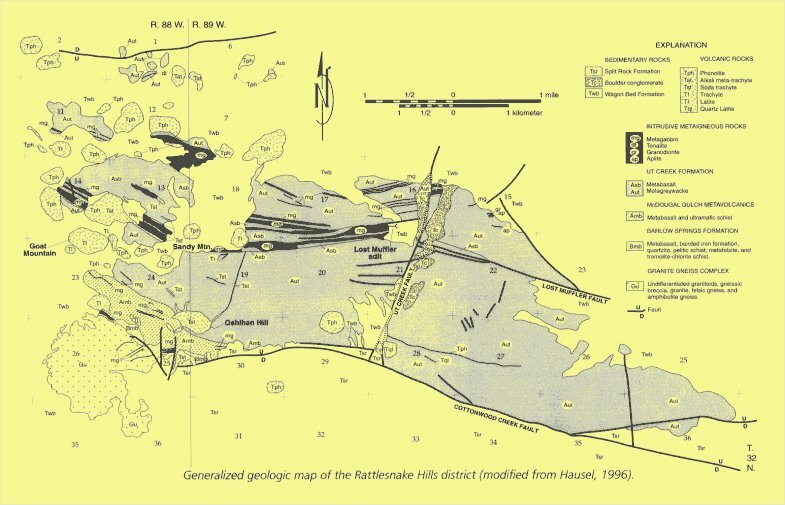 In 1981 and 1982 several gold anomalies were identified in the Rattlesnake Hills (RSH) of central Wyoming during a search for disseminated gold mineralization financed by a grant to Dan Hausel from the University of Wyoming Mining and Mineral Resource & Research Institute. Based on what was known of the geology at that time, I was able to predict that the RSH had very high potential for discovery of disseminated gold mineralization. At the time, I was awarded a small MMRRI grant to search for bulk minable gold deposits that the University could follow up with metallurgical research (Hausel and Jones, 1982a). In addition to disseminated gold, high-grade gold mineralization was detected (Hausel and Jones, 1982b) and the RSH was interpreted as a fragment of an Archean greenstone belt (Hausel, 1995, 1996). In 1981 and 1982, I outlined a whole new gold district that had been missed by others - this was one of many discoveries over 29 years at the WGS. The district included Archean gold in veins, exhalites, banded iron formation, sulfides, stockworks & Tertiary gold in breccia pipes & phonolites. It was an important discovery, but how important would have to wait several years. I mapped the greenstone belt and its Tertiary intrusives and found evidence for several gold deposits. Mining companies (including ACNC, Newmont, Canyon Resources, Bald Mountain) explored this district following my discovery & added several very attractive drill intersepts that proved this was a district of note. More recently, Evolving Gold drilled a large breccia pipe along the edge of Sandy Mountain & discovered commercial gold mineralization at depth - a possible Cripple Creek-type gold deposit! The breccia lies between Sandy Mountain, Oshihan Hill & Goat Mountain covering a surface area of one square mile. This significant discovery will likely result in Wyoming's first gold mine in many decades.